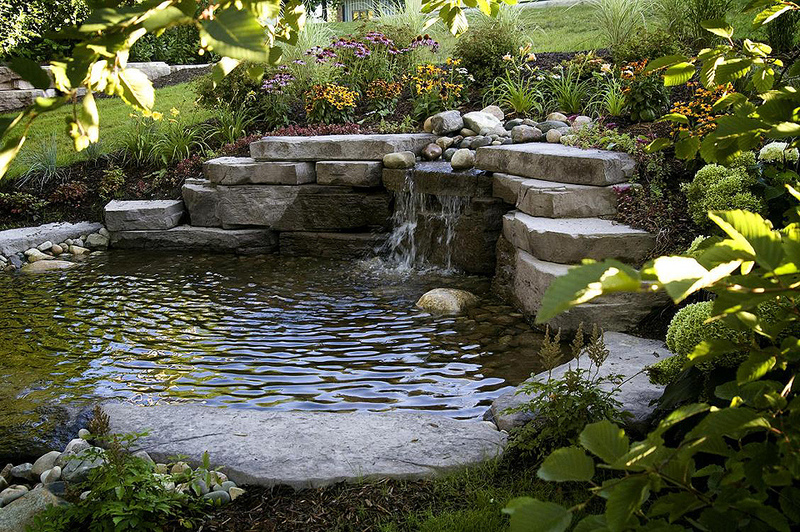 Hernandez Brothers Professional Landscape is your one source for professional water feature design, ponds, water fall and creek installation services in the Rockford Illinois and surrounding areas. At Hernandez Brothers Professional Landscape, we believe that to enjoy life… one must bond with nature. Our ponds and waterfalls allow that to happen. When the stress and pressures of daily life get you down, our ponds and waterfalls offer the body and mind an oasis… right in the convenience and comfort of your own back yard. Our beautiful outdoor water features will enrich your garden with soothing, mesmerizing water sounds that range from gushing waterfalls to babbling brooks, to a serene pond. With a water feature your outdoor living space will quickly become a place you can't wait to go to each day to unwind, relax and enjoy your surroundings. All of our garden water features are meticulously crafted to give you a maximum enjoyment of the visual beauty and delightful water fall sounds. An outdoor water feature will bring you soothing joy for many years and will add peace and serenity to your garden, patio, deck or landscaped area. Let our relaxation/design experts create the perfect back to nature hideaway to attain your customized personal vision of peace and tranquility in your very own personal oasis. We can design a waterfall and pond to work within almost any environment to achieve almost any look possible. We have a variety of materials to choose from in designing the look of your waterfall or pond. Our experienced designers can create ponds with walkways and walking bridges in a variety of materials and finishes as well. Our waterfalls can also be built to aide in restful sleeping. We can, and have… constructed waterfalls and ponds to cast moonlight reflections off of the surface of the water onto a specific window of the house and to provide natural and restful waterfall sounds to emanate into a bedroom to help in restful, re-invigorating sleep.